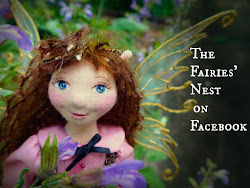 The Fairies Nest - OOAK Cloth Dolls & Fiber Fantasies: Last Ones! Well the last ones for this year anyway. 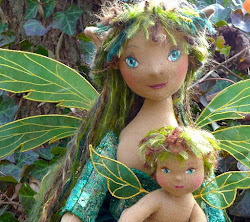 I loaded these ladies into the shop this morning and now I'll be working on presents for the next few weeks. Every year I say I'll get them made in advance, and every year I end up with a bunch to make right before the holidays...I must be a pressure junkie. 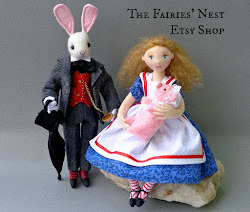 I'm planning on closing the shop on the 14th so I can concentrate on cookie making, present wrapping, egg nog drinking and all that other fun holiday stuff, but I promise to still keep updating my blog until I reopen in January. So wish me luck and no tangles as I delve into my tasks... and I will see you soon! ...and in the same Holiday spirit, I made a fun Ornament treasury today that you should definitely take a peek at here! That's a wonderful treasury and would make a great front page. I hope to see pictures of some of your own holiday displays. They are sooo cute!!! I just love them! thanks for popping over too! going to check out your treasury now! oooopss...sorry just a tad late on the treasury - silly me, should have looked at the date!